In the 19th century, death was simply part of life. High infant mortality, primitive sanitation, and a lack of basic health care meant that those lucky enough to survive were surrounded with reminders of the brevity of life at all times. And nobody was excluded from elaborate mourning rituals dedicated to celebrating and crying over the dearly departed, not even kids. Created around 1850, this sampler was painstakingly cross-stitched with silk on cotton, presumably by a young girl learning how to sew. It’s dedicated to “Grandmother” and shows some angels crying at a grave. An anchor—symbol of hope and the cross—leans against the grave, indicating that Grandma has probably gone on to better things. 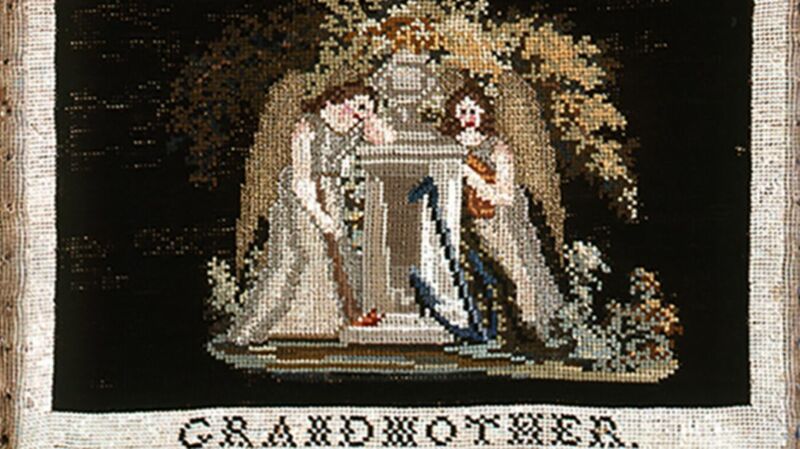 It must have taken the sampler’s creator a long time to sew it: It’s nearly a foot tall and over 15 inches wide. That’s a lot of cross-stitch, especially for a child. And its creator was more than likely a kid. Samplers were an important piece of the education of any upper-class girl, who would have learned how to do some decorative arts and needlework at school along with reading, writing, and other “accomplishments” like languages and piano. Samplers weren’t intended as punishments, though it’s hard to envision a 21st-century kid sitting through a long lesson on the ins and outs of fine needlework. Instead, they were a chance for girls to familiarize themselves with a variety of skills and develop the focus and discipline they’d need to do the nearly endless sewing that was the lot of the era’s women in an age before sewing machines. Even if a girl grew up rich, she would still be expected to create fine embroidery or pitch in on charity sewing projects [PDF]. Mourning samplers became popular in the United States after the death of George Washington, which launched a craze for sad sewing projects with plenty of mourning symbolism. This sampler is currently housed in the storage facility of the Cooper Hewitt, Smithsonian Design Museum in New York. Want to see more? Here are the other mourning samplers in the Cooper Hewitt collection—and you can also view a selection of the dizzying array of death-related crafts produced by 19th-century girls.